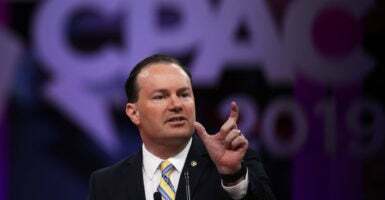 The government system known as federalism is what makes America great and guards against too much power in too few hands, Sen. Mike Lee, R-Utah, said in remarks Thursday at the Conservative Political Action Conference. “What is making America great again, and what I believe will continue to make America great again, is our continued move in that direction toward rebalancing power, toward sending power back to where it belongs, which is with the people,” Lee said in his speech at CPAC. Lee described federalism, with its emphasis on powers reserved to the states, as the key to freedom. He said “the accumulation of power in the hands of the few” is the main threat to freedom. Lee criticized the Obama administration and the Democratic Party for not remaining consistent in their demand for upholding federalism and the Constitution’s separation of powers among the legislative, executive, and judicial branches. “Where was their outrage over the violation of the Constitution and the separation of powers in the last decade?” Lee said, pointing to the national emergency that President Barack Obama declared in 2011 to take military action against Libya. The reference was to Obama’s unilateral order establishing the Deferred Action for Childhood Arrivals program, which protects hundreds of thousands of those brought here illegally as children from deportation. Separation of powers is an issue that Lee says touches deep in America’s founding, and he discusses it in a new book, “The Lost Declaration: America’s Fight Against Tyranny From King George to the Deep State,” out April 23. He offered a solution: to have conversations about federalism and remember our nation’s history. CPAC, the largest annual national gathering of conservative activists, runs through Saturday at the Gaylord National Resort and Convention Center in National Harbor, Maryland, just outside Washington.